An eraser is a product designed to rub out pencil or pen mistakes. Many pencils have an eraser on one end for users' convenience. Besides common erasing applications, erasers can also be used to wipe stains on the shoes, cars, etc., or even used as a gift or craft if they are good looking. 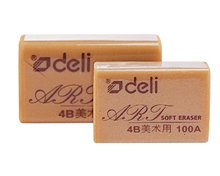 Deli Stationery is a China eraser supplier. Due to our continued focus on quality and environment, we have been awarded the ISO9001:2000 and ISO14001:2004 certificates. Some of our primary products include eraser, notebook, paper shredder, calculator, glue stick, etc. As a result of our reliable quality and reasonable prices, our office supplies are well received in the USA, Canada, Australia, Russia, Britain, Germany, Italy, France, among other countries. Please don't hesitate to contact us if you are in need of any of our stationery.